The Future of Marketing is Here! As we enter 2013, Interpersonal Marketing has taken a lead position in how a company can most strategically market itself today. Interpersonal Marketing takes some of the best of traditional marketing techniques and adapts them to the latest technology, including smartphones and social media. It all starts with the CREATIVE, and from there the DISTRIBUTION of that material. This then can be fine-tuned and MEASURED using an array of reports and tools and then MONITORED and ANALYZED. This analysis is imperative to helping companies become more competitive and capture greater market share in today’s ever-changing environment. CREATIVE: There was a time when getting an organization’s message out there meant designing creative used for radio, print and television. After 1995, online creative entered the mix. In today’s world, the solution is more complex, incorporating some of the strongest techniques of traditional PR alongside the artistic expression found in ad creation. It all begins with a company’s “Story to Tell”. There are many directions an organization can take here, and there is no one solution that fits every company. We can work with your company’s news and website updates, your blog postings, your photos and your video, adapting an Interpersonal Marketing strategy from this array of content. Imagine you’re an event producer and you’ve just produced a music awards show, which you’d like to promote using Interpersonal Marketing strategies for the following year’s performance. The creative would include reviews, editorial, photos and videos of the currently produced show, used in your organization’s marketing outreach for the entire upcoming year. It would also include any and all updates and content from the upcoming year’s list of performers, including interviews and links to their latest event calendar and music releases. 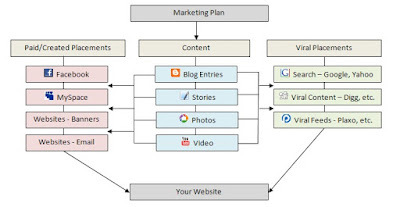 If you’re a destination looking to promote itself using some of the strategies and techniques of Interpersonal Marketing, there is a wide array of content and content styles from which to choose from. Upcoming events, restaurant, bar and club updates, hotel openings, interviews with local businesses and their owners, and more. The style can be done using a combination of editorial and photos, perhaps in a blog format, as well as in video, using a personality on camera to walk the audience through the scene. Whatever your organization does, the key to effective Interpersonal Marketing is starting with a good story, told by the creative. With Pink Banana Media’s team of experts, we can get you there. Innovative and engaging content such as blogs, photos and videos can work for you by being shared, liked, commented, re-Tweeted, etc. This is what gives your messaging, products, services – and ultimately, your brand – the visibility you need! 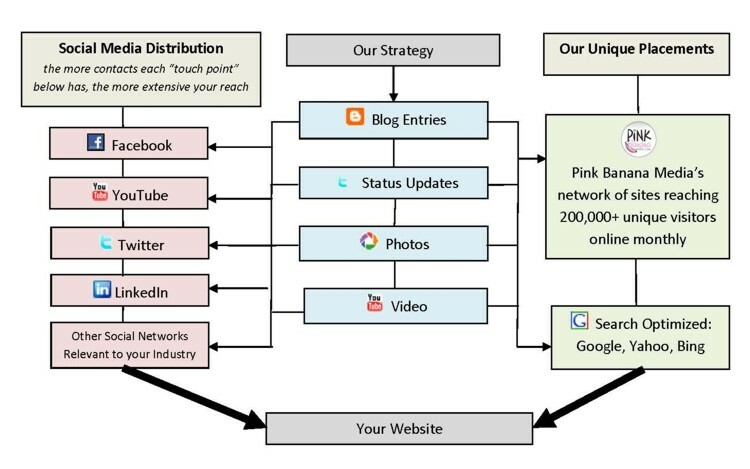 DISTRIBUTION: This is where the strategy of merging a company’s PR with their marketing outreach comes into play. A company can still use a traditional ad buy in order to get the word out, but it should also include e-mail marketing and social media outreach done by the media company they are buying advertising with, as part of the overall marketing plan. Here at Pink Banana Media, our method is simple. 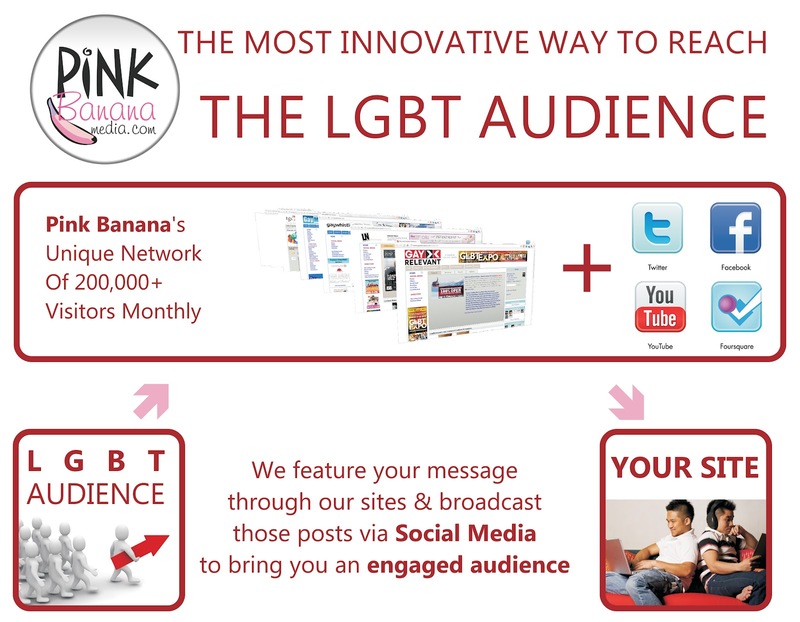 We employ blog technology as our primary content/touch point, distributing your message both directly through our network of LGBT websites, as well as social media links on Facebook, Twitter and more. These blog entries will have direct links to your product/service/event and can include photos and video, both linked and embedded (if you have an existing blog or website posts, we may use those instead). 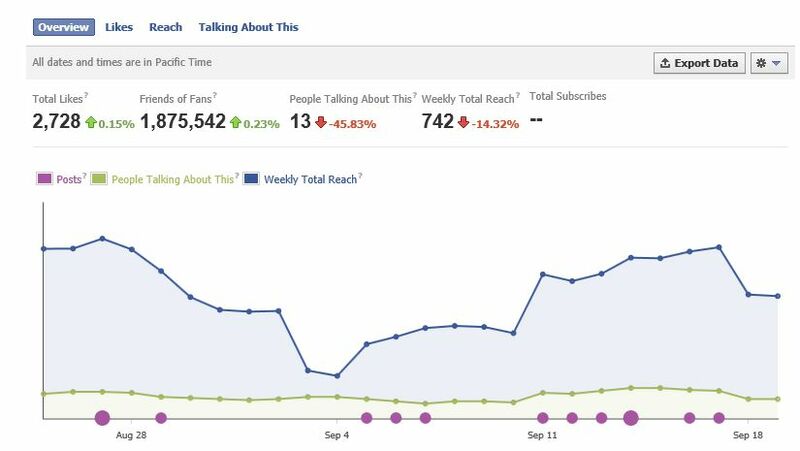 Our social media promotion will include distribution through what we find as the most influential social media fan/business pages and individuals that are directly related to your product/service/event. Online User Engagement is the top priority. Engaged users are users who read this blog entry then react. They comment on the blog, post it on Twitter and/or Facebook, or write about it on their own blog. 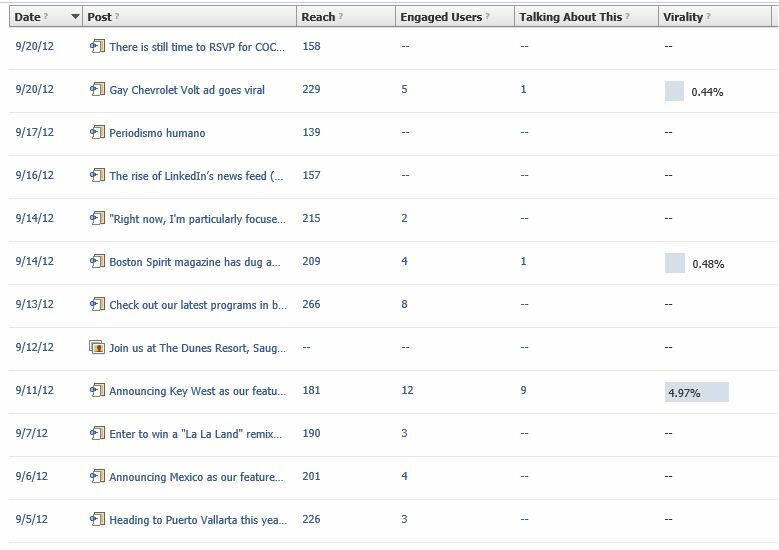 These kinds of reactions are important because they dramatically expand a blog entry's reach. If you have 10 readers who read your post but don't react, you'll reach 10 people. If you have 10 readers who post your article on Twitter where they're followed by 100 people, you'll reach 1,000 people. Engagement is desirable for traditional media, but since traditional media’s revenue comes from traffic, their focus is on page views and unique visitors. Our focus is on reach! Lastly, blogs are very search-engine friendly… this blog entry will become a strong part of your company’s overall SEO (Search Engine Optimization) strategy for this specific product/service/event. Two examples of websites within our network, incorporating social media integration with content and online community. Banner advertising opportunities are also available as well. Our direct network includes GayMonde.com (travel) and GayRelevant.com (lifestyle). 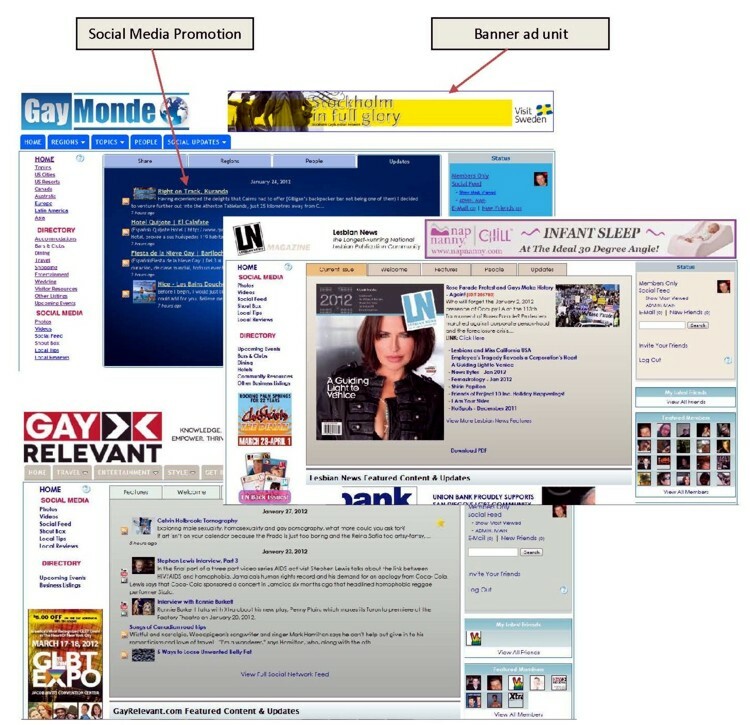 Other sites in our network include LesbianNews.com, GayWhistler.com, LGBTNewMedia.com, Navigaytour.com, GoGayFortLauderdale.com, CaliforniaGayChamber.com, GayVegasTravel.com and more, reaching a wide variety of LGBT online consumers interested in entertainment, style, fashion, travel, health, new media and more. Increased product or retail sales, as measured by current retail sales when this campaign began (i.e., if you were at $500 per month on average and with this campaign alone, retail sales grew to $1,000 per month, this would be one form of our measurement of success). Number of members in your Facebook Fan Page (Facebook offers a wide array of key metrics for your page, including Global Ranking statistics, information on who is sharing your posts and how wide your social media reach is, just to name a few). Search Engine Placement, as measured by your current Google ranking for perhaps 5 specific search terms related to your company and how that Google ranking and search results placement improves over a 30 day period. MONITORING: This area of marketing has grown tremendously over the past few years, as both the technology and volume of social media marketing has advanced. In today’s world, every time we post on Facebook or LinkedIn, the posting simultaneously (and automatically) posts on Twitter. Twitter is unique in that it is used in such a wide variety of ways... some people pay attention to the postings of those they follow, while others pay closer attention to what anyone is saying based upon doing key word searches on a particular industry, such as "gay travel" or "gay hotel Miami". No matter how it is utilized, most social media monitoring tools use Twitter and Facebook as key components in order to determine how "relevant" a company's posting is, with the relevance increasing the more individual users share, like or comment these postings, updates and tweets. The greater the relevance, the greater the postings’ chances are of being seen by others. Those articles and postings that are “relevant” are considered to be “trending” and can be monitored by programs such as BottleNose, which provides a very good snapshot of trending articles and posts based on key words, as well as trending topics, photos, people and companies to follow, including a feed of recent Tweets. ANALYSIS: This area of Interpersonal Marketing is the newest and most changing in today’s strategic marketing mix. It mixes marketing with customer relationship management, and allows an organization to incorporate a variety of strategies in how it deals with information related to its field of expertise, its competitors and the very organization itself. Imagine you are marketing a hotel in Miami Beach. The various key words to monitor could include “hotel Miami,” as well as “travel Miami,” allowing you to monitor and stay on top of all relevant conversations happening online related to an individual wishing to travel to Miami. You could also monitor more specific key words, such as “gay hotel Miami” if you’re marketing more specifically to the LGBT market. In addition, you could also monitor some of your competitor’s names, so that if they or anyone else was posting about one of your competitor’s hotels, you would know about it. Lastly, you could monitor your own company name, so that if anyone had anything to say publicly about your company, you would know about it right away. How is this information useful? In a wide variety of ways. Knowing who is talking about what related to your specific industry allows your organization to establish a set of outreach rules and guidelines when it comes to utilizing this information to your company’s advantage. If you know someone gay is traveling to Miami, making either a direct connection or a public connection with that person via social media allows you to steer their conversation, and hopefully their travel decisions, in your direction. The more public you are with these conversations, the more marketing-oriented it is, as others can see these conversations as well. Many a hotel and airline have monitored the “social media airwaves” for these and other key word conversations and publicly steered the conversation their way, often in a less direct and more subtle style of suggestion rather than just saying “Stay with us!” They also stay on top of opportunities made available by a competitors’ missteps, offering to help a potential customer in a public way. 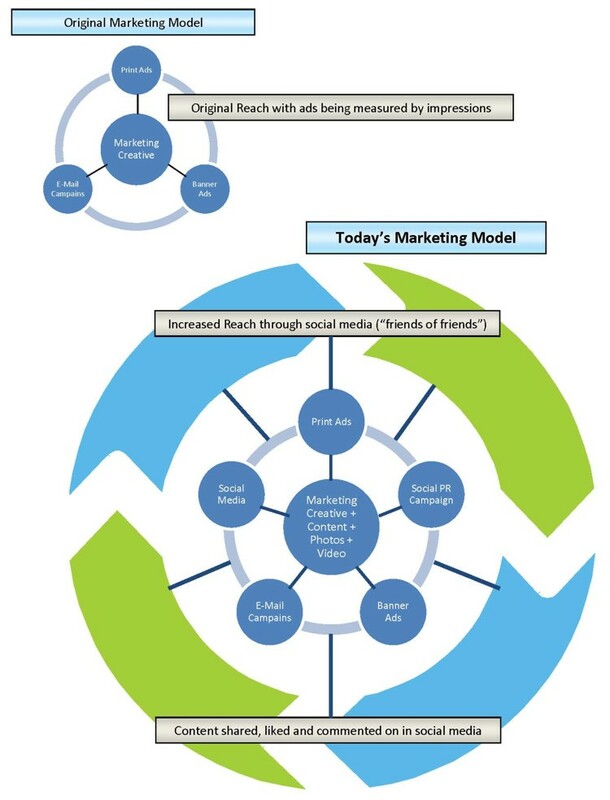 In summary, we’ve heard over the last few years about the “360 degree approach to marketing”, looking at all of the various marketing channels and touch points and developing a common, unifying creative story to share among each channel. In today’s world, we’re adding a new dimension to that approach, keeping the various marketing channels and touch points intact, but incorporating an Interpersonal Marketing strategy of content and editorial as part of the marketing mix. We are leveraging the collective power of the individual to share, comment and like this content, spreading your organization’s message farther and wider than ever before, while maintaining and increasing your organization’s relevance in a socially engaged world. Really good advice!!! Thank you for the valuable information on this tips.